After some prodding and a lot of discussion, these are the three members that were "selected" as club officers for the year 2001. From left to right they are Jim Cook - secretary, Bob Hollister - vice president, and Dave Benny - president. We all want to thank Dennis Russell - president, Bill Sieberg - vice president, and Dave Benny - Secretary/Treasurer for their years of service to the club. Many of the Clubs that are best known in the area can attribute their noteriety to a Club event. Some car clubs are known for their great tours. Others are know for car shows and still others are known for their flea markets. Since part of our mission of our club is to develop interest in the model T, we should be doing something that brings our existance into the public eye. Ray Sutton suggested that we have a flea market either in Findlay or Lima to help boost the treasury. There was a discussion about the limits and/or inclusions of such an event. It was noted that events that are era exclusive are not well attended in this area. We need to determine if it is more important to have a big event that is well attended and includes all makes/years of cars or a smaller event that is restricted to certain makes/years of cars. If we do either event, we will need the dedication and support of all of the member to make it work out well for the club. The electrical problem at Jack's during the last meeting was correctly diagnosed by Dennis Russell. The culprit was a faulty underground connection that was placed in the ground 30 years ago. It had deteriorated to aluminum oxide only and would no longer carry power. A temporary service was installed by 11:30 that night with full restoration completed on the following Monday. Many thanks to Dennis for getting us enough power to run the lights. We'd also like to take this opportunity to thank Jack for letting us use his shop as a meeting place. The area is always kept clean with cookies and drinks provided for each club meeting. After searching some of the other Model T web sites, it would appear that many of the clubs meet at an eating establishment at least 4 times a year. What does the rest of the club think of this idea? We always have more members and guests at our Christmas party. And, this may make the project nights at our regular meeting spot more unique. 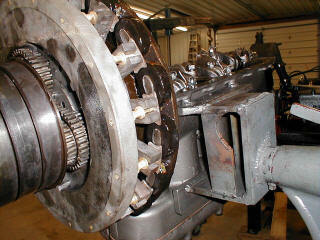 This month,s demonstration will be on the tear down and repair of the Model T drive shaft. We're not going to just talk about it. 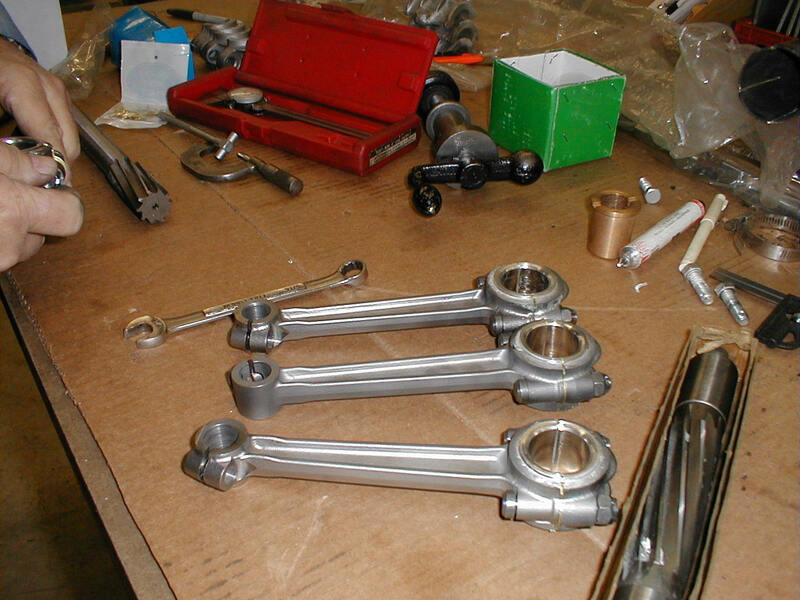 This will be a live demonstration to show how to remove the axel housing, universal, joint housing plugs, joint knucle pin, driveshaft pinion gear, driveshaft roller bearing, driveshaft sleeve, and driveshaft front bushing. Come to the meeting and learn the tricks of the Ford mechanic's trade. By the way, we'll also rebuild the driveshaft for reistallation. This photograph shows the early work by Bill Sieberg on a 1910 Model T which belongs to Richard Briggs, club member from Spencerville, Ohio. In the picture the front fenders are being *fitted to the frame. *note - This is the difference between an experienced metal worker and the rest of us. The rest of us attach fenders. The finished project will show the true difference between the two methods. Here we see the engine running with the exhaust pipe sticking out the door. 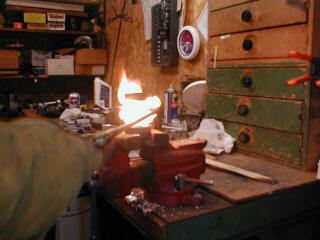 Some of us tried to hand crank this engine at the last meeting with little success. Since that time, the carb. has been adjusted and the engine will start on 1/4 pull on magneto. Let's all try again on Wednesday night. 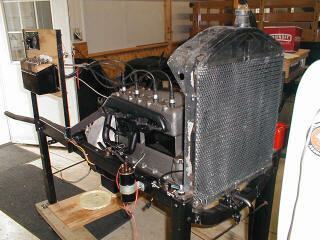 Jim Cook's 1916 engine continues to show signs of life. In this shot the engine is ready to have the engine pan and hogshead reinstalled. Those are double stacked coils on the magneto. This engine was cast September 18, 1915; so, it has features of a 1915. 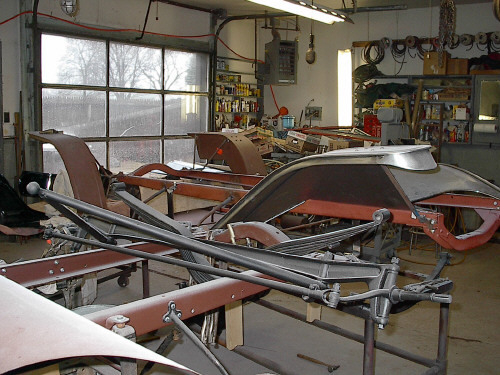 If someone has a project that they are working on and would like the club to help out, bring it up at the meeting for the members to discuss.� There is a great amount of knowledge in the group.� Every one of us can make a difference in the group.� We might even decide to have the next meeting in your garage for a little hands-on-experience. In the News under upcoming events,� Model T Tours Unlimited is planning� the second Texas to Alaska Model T Adventure.� Also, The Tinkerin' T's of Central Ohio are planning a tour to the Amish country in May. The tour travels from Pickerington to Berlin, Ohio down country roads and secondary State Highways. Ask about either one of these tours at the Club meeting for further information. Gather a small group of Model "T" owners together and I promise you can get a lively discussion going just by innocently asking which timer works best on the "T". Let's talk about the system Henry designed into our beloved T's. A low voltage mechanical timer to send 6 volts to the coils. With something that simple nothing can go wrong, right?? As all of us who have cussed this system know, there are several problems with this "low-tension" design. Ford knew there were problems with the timers as evidenced by their continuous experiments with various materials and designs starting almost the day the "T" came out in 1909 and continuing until the last one came off the assembly line in 1927. Henry buried the timer down on the front of the engine where it is not particularly easy to get at but it is certainly easy for oil, dirt, and water to find it! If you're using a conventional timer with a roller then a little oil is needed but it should be clean oil and it should be a small amount of oil. The "Tiger" timer is the modern day equivalent of the original Ford timer. Some folks swear by them and other folks swear at them. To get reasonable life and smooth operation, the "Tiger" needs to be cleaned and oiled just about every time we take our "T" out. Being a lazy guy, this is not my favorite timer! Another popular timer design was the "New Day" timer. It was sold during the model "T" period and is still available today from any Model "T" parts supplier. The "New Day" uses a bakelite housing with a spring-loaded copper brush which wipes around and over four copper contacts. The timer case says, "Never needs oiling" but a little lubricant smeared aroung the path of the rotating brush will greatly increase the life of the "New Day" timer. A quick wipe of fresh lubricant every once in a while won't hurt anything either but it is more maintenance free than the "Tiger". The problem with both of these timers is the relatively short life they have. Most folks I've talked with say they replace these timers each season or about every 1000 miles. Back in the Model "T" period both these timers could be bought new for about a dollar to a dollar and a half but now you won't get too much change when you hand the friendly parts man a ten and a twenty for one! Again, back in the "T" era, there was a company that sold seemingly hundreds of gadgets and accessories for the Model "T". The company was "The Anderson Company" and their product name was "Anco". You'll find many of their ads in the magazines of the period. One of their products was the "Anco" Timer. It used a different principle than the "Tiger" or the "New Day". 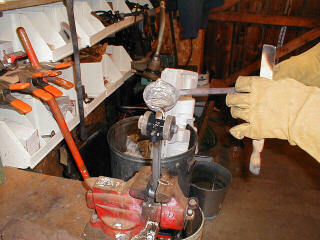 It used a spring-loaded steel brush which pressed against four steel fingers as it rotated around the housing. This eliminated the biggest problem with both the "Tiger" and the "New Day" which was the uneven wear between the metal contacts and the insulating material on either side of the contacts! The insulation, being softer, always wore faster and, sooner or later, caused the roller or brush to jump when it passed over the high/low spots! The Anco didn't and doesn't have this problem. The Anderson Company and Anco are long gone but a fella by the name of Bob Thompson has resurrected the Anco design and upgraded it to use today's modern high grade steel for the contacts and brush. Folks, this timer is a winner! Bob is so confident, he gives a 2 year warranty on it! Just like the "EverReady bunny", it just keeps going and going! I've got one on my '12 Touring that's got 4000 miles on it now and it still ticks along like new! You'll find Anderson timer in most of the Model "T" catalogs. They cost a little more but are well worth it!